With its old oak beams, cosy log burner and hops hanging above the bar, The Chequers Inn in Heaverham is the picture-perfect Kentish country pub. Dating back to the16th century, the family-friendly pub wears its history with sublime style, providing an authentic, atmospheric setting in which to enjoy fine food and drink. The fare here is traditional, tasty and unpretentious, with freshly made dishes crafted from wholesome local produce. The beer, too, has a local flavour, thanks to ales and lagers supplied by Faversham’s Shepherd Neame brewery. There’s plenty to do at The Chequers, so how you spend your time here is entirely in your hands. You can enjoy a memorable meal in the restaurant, or savour a quiet pint in the quaint and cosy bar - with traditional pub games like shove ha’penny, cribbage and cards for company. There’s also a garden to explore in summer, complete with a traditional bat and trap pitch, and when you want to make your own entertainment, you can hire the pub’s beautiful wattle-and-daub Tudor barn - one of the finest venues in the Sevenoaks area for private parties. All the team - William included - look forward to seeing you soon. 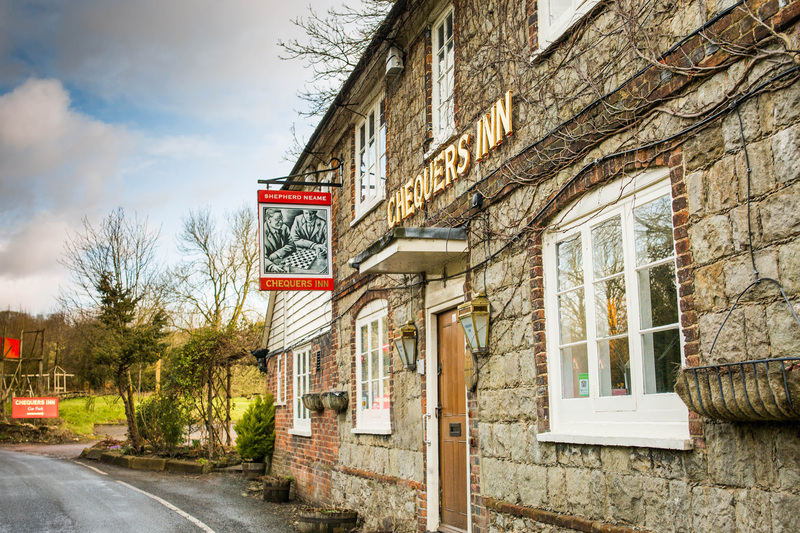 The Chequers Inn is a popular place for pub food in Sevenoaks, serving wholesome, hearty classics crafted from fresh, seasonal ingredients, six days a week. The pub always aims to serve unpretentious food, focusing on quality and care rather than fashionable ingredients - and sources produce locally as much as possible. The kitchen is closed on Mondays, but you’ll find lunch and evening service here Tuesday to Saturday, and a traditional roast served 12pm to 3pm on Sundays. Book a table today to make sure you don’t miss out! A special occasion deserves a special setting, and the stunning wattle-and-daub barn at The Chequers Inn certainly fits that description! The beautiful barn is ideal for all kinds of private functions, including wedding receptions, birthday parties, barn dances and even business meetings. There is also a separate restaurant here, offering private dining for up to 40 people. Just get in touch if you’d like to discuss holding your special event at The Chequers.